Lamb Report: I got down to the barn a little late this morning, and yet not a single sheep except Cary stood up to greet me. Usually if the sun is already shining brightly and it's obviously going to be a hot one, there is an impatient woolly clump at the barn gate waiting to burst out. I think they're all staying up way past their bedtime listening to Alice. And just when I thought maybe he really had moved to Missouri, he announced that his nightly radio show can be heard on 50 stations across the country. Maybe there's one near you. I'm definitely going to have to email him about his barnyard listeners. He played Bob Dylan and The Rolling Stones while I was down there last night--now that's our kind of Classic Rock. Current Lamb Count: 22. Number of cows Cary, Bear, and I spotted in the hayfield yesterday while taking a relaxing early evening break on the shaded back steps: 1. Naturally no one was around on a Friday night to come and put it back where it belongs. I need to go see if it's still out there--and if it has friends. Usually they travel in packs. Cow packs???? That sounds dangerous! I've had really good luck chasing them off with a broom. PS. My kids adore your Cary stories. So I assume this is not your cow? The worst visitor I've had was a stray cat that decided to go live in my dirt basement. He/she kept getting in through a space under the outside door and when I was working on the blog in my office (right over the basement) it sounded like the house was haunted. Glad to hear the sheep have good taste in music. So are cow packs the "gangs" of the barnyard? I think if you e-mailed him that he'd get a kick out of it. Maybe request a song, while you are at it. I just can't think of a fitting one right now. . . . I've been a gardener for most of my life and I love reading your garden blog. I think we might have been separated at birth!!!! Sheep, I know nothing about. The lambs are cute and fuzzy. I sometimes wish my dogs were sheep...no mowing for me. Hang on a minute, it's early Sunday morning here so excuse me if I'm not too lucid FG but is the lamb one of the flock previously thought to have succombed to the mystery predator? Cute pic whatever. We have Alice here in Portland, and now we always think of you and your gang in the barn when we have him on...! So glad your kids are enjoying hearing about Cary. Thanks for letting me know. No, it wasn't our cow. And after hearing your story, I suppose it could have been worse--it was only out in the field, not in the house. But speaking of indoor intruders, this morning a seemingly paralyzed mouse materialized out of nowhere and was sitting right in the middle of the walkway from the kitchen to the living room. I grabbed Molly Doodlebug and tried unsuccessfully to point out the mouse to her, at one point practically dropping her snarling little body right on top of it. She never saw it, and during the whole episode, the mouse didn't move. I finally plunked an empty sour cream container over it, scooped it up with my gloved hand covering the top, peeked in long enough to see that the mouse was alive, and deposited it halfway between the barn and the house. Never a dull moment. Oh, and bear in mind I was only half awake during this operation. No, lamb packs are the "gangs" of the barnyard. You won't believe those little troublemakers. More about them another time. Thanks. Yep, I've definitely put "Email Alice Cooper" on my To Do List. And yes! We need to come up with a good song I can request. Then, of course, I need to ask him to please let me know before he plays it so I can be down in the barn. Plus if I have any advance notice, I can let interested FF readers know and they can tune in if they get his show. We need some kind of barnyard/animal themed classic rock song! Well, aren't you just too sweet. And I'm so glad you love the garden blog. Even though the idea was to start basically an online personal gardening journal for myself, I (obviously) realize other people read it, and sometimes I find myself thinking: Who is going to care about this!? Then I remind myself it's MY personal garden journal--or somebody like you leaves me a great comment. Thank you. 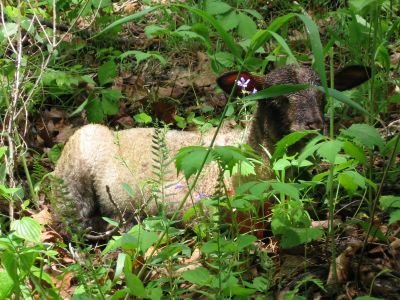 Unfortunately, no, that camo-lambo was not one of the three missing lambs that were taken in the night by an unknown/unseen predator. That sure was a lovely thought, though. "Born to Be Wild" by Steppenwolf. Anyone think of a better one?